ManyChat has revolutionized the way that we are now able to use Facebook Messenger. Before we dig in to this full blown ManyChat tutorial, let's hit you with some real world statistics to get you excited about Manychat, messenger marketing, and it's potential to transform your business. You are reading those numbers right! Just take a look at that first broadcast. 1,063 messages sent with a 99.7% open rate and a 44.5% click through rate! If that doesn't get you excited or seeing the potential of messenger marketing, we're not sure what will! So we should have you hooked now on why you want to be using this marketing medium. (NOTE: Not many marketers are taking advantage of this so it WILL PAY to be one of the early adopters here!) It's time to dive in to the messenger marketing and ManyChat tutorial. To make this 'book of a blog post' on Messenger Marketing easier to use, we have the index below to help navigate different sections — or feel free to scroll! It's no secret that Facebook is a behemoth marketing platform online. With now over 2 Billion monthly users, if Facebook were a country, it would be just short of the combined population of the two most populated countries on earth – China and India! So, of course, it's a dream come true for visionary marketers. Yet until now, the atmosphere where you could effectively follow-up with prospects, has not been ideal. In marketing, any time you have to interrupt the flow of the sales cycle, you're creating holes where prospects can leak out. This is true in any marketing media, but especially online where attention spans are minuscule and growing shorter by the day. The other reason is that until now, Facebook messenger has had next to no automation. Imagine trying to do email marketing before the invention of the auto-responder. Having to email each person individually, one at a time. No automation, no sequences, and broadcasting meant you had to send 1 mass spammy email using your normal email address. Sure it didn't stop spammers back in the day, because spammers will always spam, but for those wanting to create a successful online business ethically using effective systems, it's just not doable. It's due time to cut out the middle man, don't you think? 99.9% of your competition has no clue that Facebook Messenger can be used like this. YOU are now officially vastly ahead of the crowd. And if you lock and load now, the chances of them catching up are slim to none! As soon as you fire up the ManyChat bot and start to connect with your target audience in the place where they're dramatically more responsive and almost always at (practically hoping for a message to come through), you have the ability to take your targeted connections from prospect to paying customer ALL without ever leaving Facebook. And ManyChat almost completely automates that process. YOU are in the right place, at the right time, and times like these don't come around often. It's up to you to grab on, buckle up and enjoy the ride. Put your current email marketing open and click thru rates to absolute shame. Complete the entire marketing and sales cycle... without ever pulling prospects away from Facebook! Turn website and blog visitors into Facebook subscribers with just 1-click! Instantly Get Targeted Prospects to Talk to with Facebook LIVE! 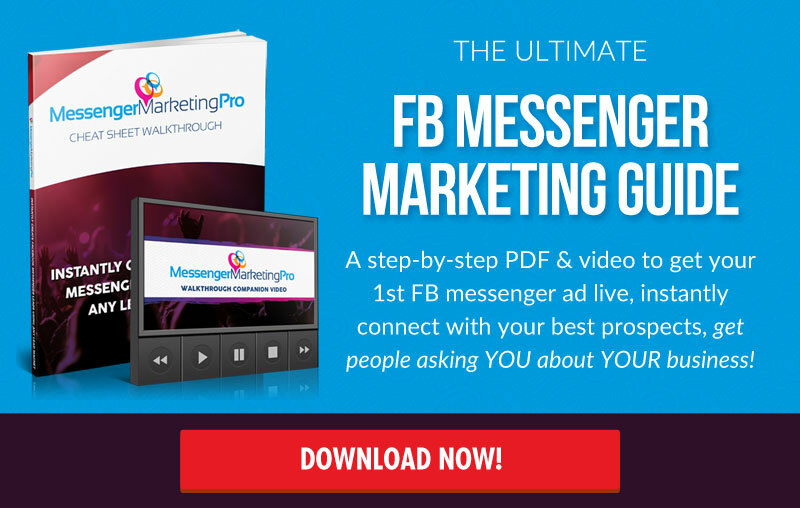 Watch the Video Below And See the Vision of What Facebook Messenger Marketing Can Do for YOU! 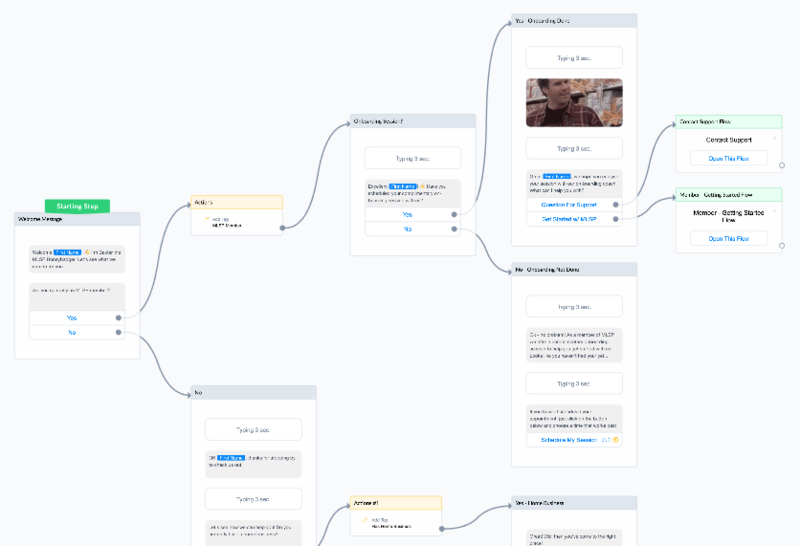 ManyChat is a visual bot builder that integrates within Facebook messenger, and makes most of the automation that we've talked about (and dreamed about) with messenger possible. 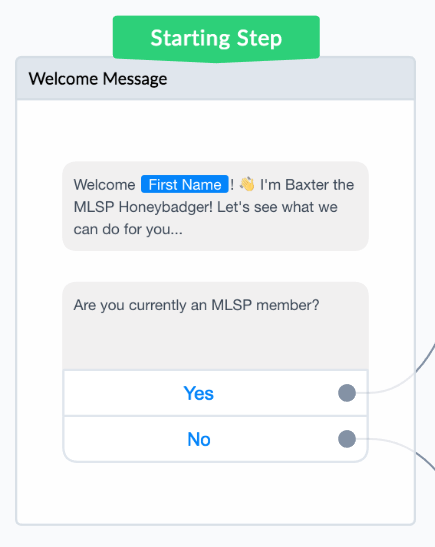 Throughout this manychat tutorial we've been not-so-subtly hinting about this tool...or more specifically this BOT...that you can use to automate your messenger marketing campaigns. 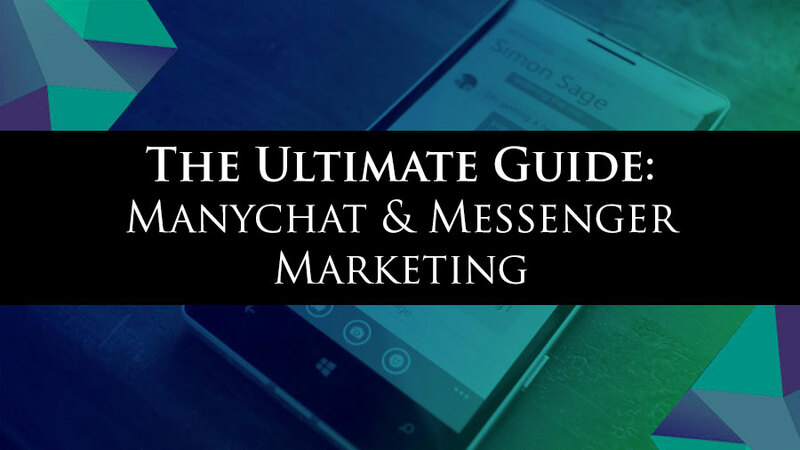 In this section we're going to give you a thorough ManyChat tutorial so that you can see exactly how to use ManyChat, and start using it inside of your Messenger Marketing to grow your business with some awesome automation! 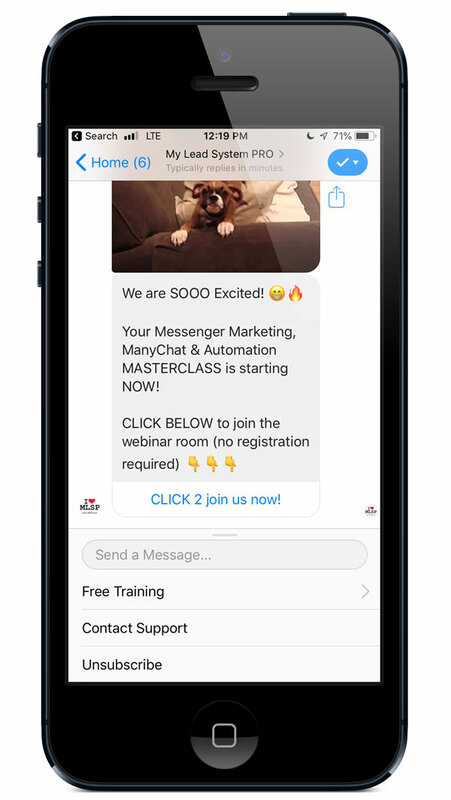 Can you implement a Facebook Messenger Campaign without the ManyChat bot? Actually, yes you can. However, doing so would be sort of like doing email marketing without an auto-responder. It is possible of course, but the difference in effectiveness is vast. This is essentially a FREE tool, however there is a PRO version that you can upgrade to very inexpensively ($10/month). There are few very good and specific reasons that we recommend ManyChat. First of all, our in-house Facebook expert, MLSP CMO Jesse Jameson has managed multi-million dollar Facebook campaigns for top companies in the industry, and he gives ManyChat his highest recommendation. This bot is actually highly recommended by Facebook themselves. It's been around for quite some time, therefore it's seasoned, with most of the kinks worked out already. It's a hugely trusted tool. But most of all, as you'll see, it's very simple to use! Let's Take a Closer Look at the Dashboard of ManyChat! The interface inside ManyChat is user-friendly, and simple to navigate around in. The main screen of the dashboard gives you a bird's eye view. 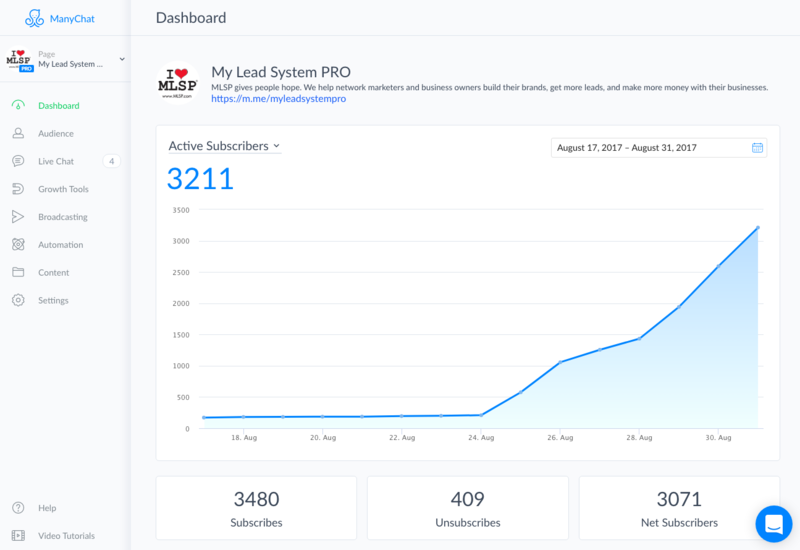 As soon as you log in, you'll see your number of active subscribers, unsubscribes, as well as a graph that keeps track of your subscriber growth. On the left hand side you'll see the different features within Manychat, and we'll go over each of those now! The Audience Section is of course extremely important. This is where you'll get to see anybody who has ever subscribed to your messenger list. Add your subscribers to different messenger sequences as you see fit. Pull up a "context card" on any subscriber and see a summary of each individual (including associated tags , best time to call them), or you can simply engage in a chat with them right then and there! Search for specific subscribers you want to correspond with. You can actually chat with your subscriber right inside the ManyChat platform itself. Manage the different conversations you have going with your prospects. See all the tags associated with different individuals for memory recall on specific things about that person. See where they came in as a subscriber so you can gauge their interest as you're chatting. Add tags or add subscribers to a sequence during your chat session so that you stay relevant to their wants and needs. Live chat through ManyChat works just like the regular Facebook Messenger. Only ManyChat adds powerful features so that YOU can enhance your subscribers experience, allowing you to stick to what's specifically relevant for their exact wants and needs. Now comes the beefy part where the power of ManyChat really comes in. ManyChat growth tools make it easy to quickly and continuously grow your FB messenger subscriber base (with 1-click). Let's go over some of those features now! We covered the overlay widgets briefly before. Now we're going to go into more detail so that you can see just how powerful these are for growing your list. You'll also be able to watch a companion ManyChat video tutorial to see exactly how this works so you can start setting up overlays on your website today! Website overlays are similar to an email optin form. Only with ManyChat these become a 1-click subscriber button. Here are some examples of what overlays look like. This overlay basically rides right along the top of your website, where it grabs your visitor's attention almost immediately. These have proven to get great conversions, which means you'll start growing your Facebook Messenger List faster. Once selected you have a slew of options for when it appears, if it can be hidden, what the text says, etc. These slide in from the side of your site or page. You can select where the slide-in will appear (for instance, top-left, bottom-right), if you want the slide-in to come in after a certain amount of time spend on the page, or by how far down the page your website visitor scrolls. This overlay is super useful if you are giving something away like a lead magnet as you can add an image of whatever they are getting to the overlay! NOTE: One way we at MLSP use these page takeovers is to subscribe webinar registrants to a reminder list. For example, we host our Wednesday Webinar every week (as we have for 10 years now). When people register for the webinar, they are taken to the registration thank-you page. This page has valuable information on it, but when they land on it - we pop up a page overlay that says "Thanks for registering! Do you want to get a reminder for this webinar right in Facebook messenger?" It works really well in not only growing our messenger list, but being able to remind registrants to not miss the webinar! Once a website visitor clicks the "Connect With Me!" button on any of these overlays, they are automatically added as a Facebook Messenger subscriber. You can then send them an automatic message with a PDF file where they can access a lead magnet that they may have subscribed to. It goes directly to their FB messenger, where they're infinitely more likely to open the message than they would with email. 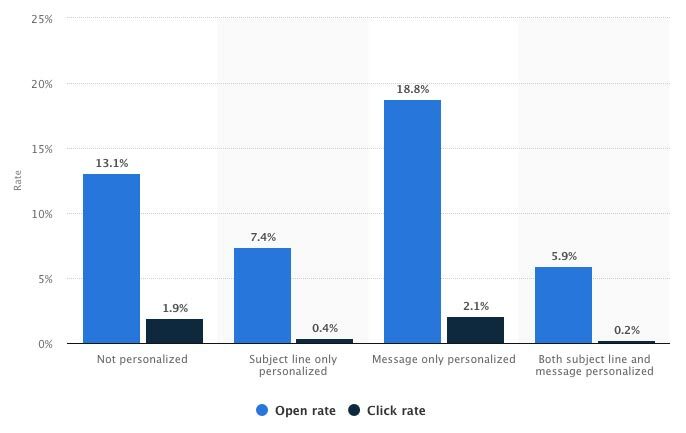 In fact, FB messenger averages around 95%+ open rates, opposed to the dismal 18% that we see in email marketing. But that's not all. You don't have to only use these widgets on your website. 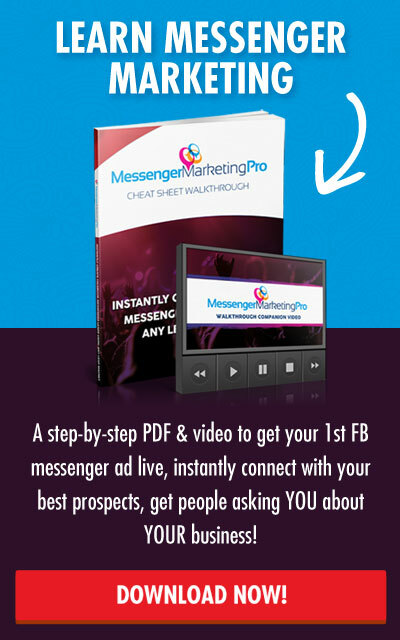 Send people straight to your messenger list with Facebook Ads! Now the point of social media marketing, the point of list building, and the point of marketing to a large extent is to ENGAGE with your audience. The more you engage with your audience, the more they begin to know, like, and TRUST you! And the more you do that... the more people want to either join you in your opportunity, or buy products from you! Luckily ManyChat makes engagement simple and automated with your Facebook messenger marketing. There are certain people in your audience, and on your Facebook list, who want to be notified when you release new content such as your Facebook posts, your blog posts, your videos, etc. You can now easily notify those people every time you release something within the "Autoposting" area. It acts very much like an RSS feed; it integrates with ManyChat and shoots your carefully tagged FB Messenger Subscribers a message announcing your latest content. Broadcasting through ManyChat and Facebook Messenger is very similar to broadcasting through email. And then you broadcast it out! This is very simple within ManyChat and it's extremely effective for engaging your audience, connecting with them on a deeper level, and having them connect with YOU! This is an incredibly powerful feature of ManyChat. This is going to allow you to interact and chat with your FB subscribers, without having to actually be there at the time. Again, it's good if you can be there to chat live as often as possible, but automation allows you to qualify your subscribers so that when you do interact live, you're dealing only with the most serious of them. Create a Menu Within Your Facebook Messages! When you create a menu within ManyChat, it gives the person messaging you a choice of where they can go with the conversation. In other words, it kind of allows them to choose where the conversation goes, and click on a menu item to indicate what type of information they're looking to get from you. This is a good place to put links to your main services or sequences. As you get more advanced, you can use these buttons to trigger engaging sequences and flows that take your prospects down a journey to discover more about them and ultimately figure out how to serve them better. If they click on 'Free Training,' they have the option to register for an upcoming webinar, visit the MyLeadySystemPRO Blog, or click on More MLSP Training which takes them to our main training page where they can see all of our upcoming webinars, access our podcast and much more. The keywords feature really gets us at MLSP very excited. Using this, you can set up keywords inside your automated system that will prompt a response as soon as someone types a certain keyword in the "Messenger App." This let's people do some self-help within messenger to get the answers they need from YOU, even when you're not physically there chatting with them. By default ManyChat provides a couple of keywords for you, like the subscribe and unsubscribe options, but you can get really creative here. For instance, if you set up the keyword "Get my gift", and they were to type that into the chat box, you could set up an automated response with the PDF Report that let's them learn more about the topic that your "gift" covers. You can even go a step further by letting them know if they simply type the word "menu" – they will be sent the menu inside the message box and, again, they can continue to choose their own adventure within the system. You can automate this functionality so you can continue to engage with your prospects while your out! 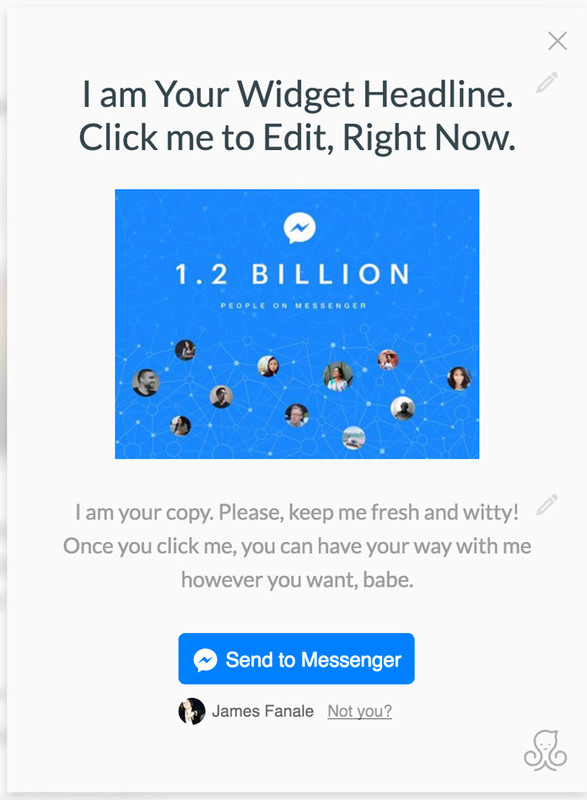 One of the first messages you’ll want to set up inside of ManyChat is your welcome message. This is going to be the very first message that all your users will receive when they interact with you on Facebook Messenger. This welcome message is going to be different for everyone, and it should be tailored to your target audience. It's a great place to learn a bit about your prospect (via questions) and put the most targeted answers and content in front of them. For example, at MLSP, the first question we ask them is if they are a member. Based on their answer, we take them down a different path. If they say no, we take some time to explain to them what MLSP is, how we can help them, and ultimately we bring them toward a webinar presentation that does the work for us. 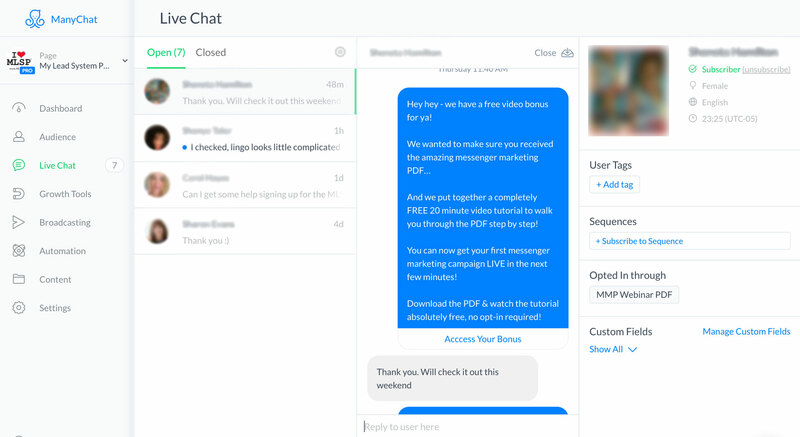 As you've likely guessed, sequences inside ManyChat are much like auto-responder messages with email. You can create a complete message sequence inside ManyChat, and set which messages will go out, and at what intervals. Also, like an email auto-responder, you can see your open rates stats and click-thru rates for your messages. Again many marketers we know using this are immediately seeing open rates as high as 95%!! The Sequences feature inside ManyChat essentially lets you stay in front of your prospects, provide value to them, and do it all in a personal (yet automated) way! The Video Below Will Show You What Sequences Look Like Inside the ManyChat Dashboard! You can also create folders to keep your content organized in a way that makes sense for your business. Utilize this page to quickly access and edit all of your ManyChat content. ManyChat Integration Can Very Easily Be Integrated With MLSP SITES! Here's a note specifically for MLSP Mastery Members! There are many great tools that MLSP gives you to grow your business. One of the ones that members absolutely love is MLSP Sites, which allows you to quickly and easily create your own blog, on the powerful WordPress platform of course, and with world class hosting, plugins and themes. 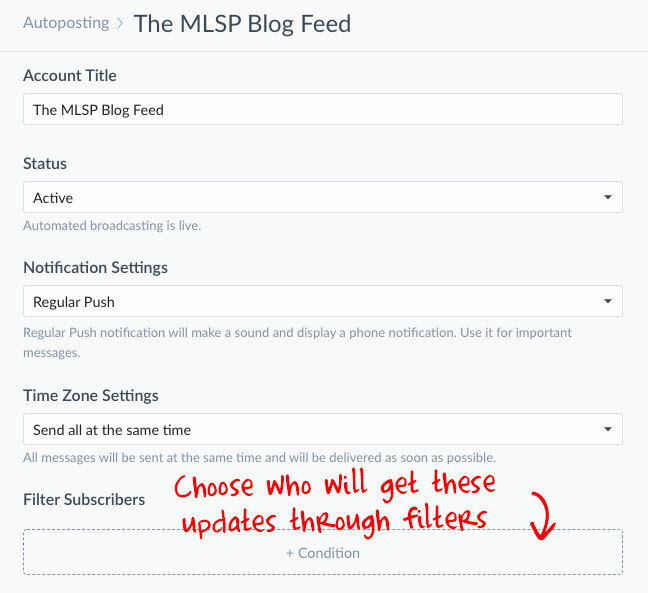 If you're a member now, you'll be glad to know that ManyChat Overlays, widgets, bars and everything else can easily be integrated on your MLSP SITES blog. If you're not yet a member of MLSP, as you can see, membership has many privileges! You now can come out of the gate running with 'Facebook Messenger Marketing'. You've been given the rock-solid foundation of this strategy! You have actionable steps you can take to get what is the next great marketing medium working for you. It's a game changer! And to think that most people don't have a clue that they can even use Facebook like this. So getting started is what to do next! Simple as that. Of course in one blog post, that's hardly enough room to scratch the surface of all the advanced strategies that you can take with this powerful marketing platform...to absolutely skyrocket your business...and ensure that you NEVER run out of people to talk to about your opportunity or products! There's an entire new level that we simply coudn't possibly get to in a blog post! But we DO have a special webinar coming up that is going to take you for a deep dive in to all things Manychat and Facebook Messenger related. 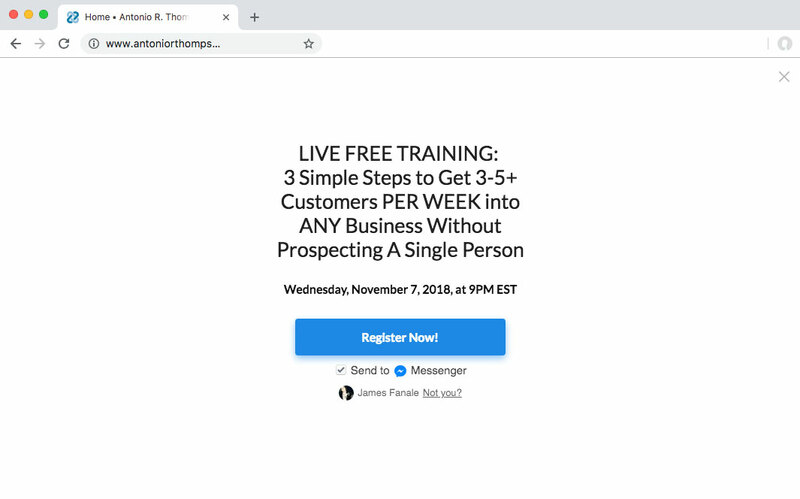 In fact, if you register for this webinar, which is part 2 of our messenger marketing masterclass, we're going to give you access to part 1 immediately! So register today! We hope you enjoy this ManyChat & FB Messenger Marketing blog post… if you got value from this post, leave us a comment here! Great post with lots of value that I’m definitely going to implement. Awesome! Glad you found this helpful. 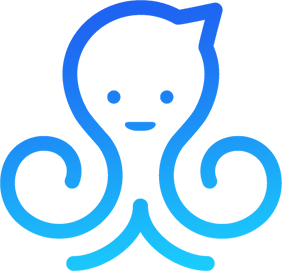 If you have any questions implementing Manychat yourself, just let us know! Beyond amazing. I can’t believe I didn’t even know this existed. The possibilities of this application are mind boggling. Love it! Am using ManyChat for a little while now. Great post! Excellent Jonas! How have your results been so far? This is great, looking forward to learning more! Excellent Alexi! Glad you found value here. Let us know what your results are like when you begin to implement Manychat! Great article. Thank you. Question: Can the actual chat box be installed on my wordpress site to replace my tawk.to chat box? Does this tool and strategy work on mobile devices or do we need to have a laptop or computer to properly utilize the features in ManyChat? It would be difficult to take advantage of all of the tools and functionality that Manychat offers using just a mobile device. The strategy itself does not require the end user to be on a computer or laptop. Messenger marketing only requires that (at least right now) the end user has Facebook Messenger.